At this point, it’s pretty safe to say that I’ll watch any show where the title begins with the name of a “Top Gear” presenter. And after this many years it’s become pretty obvious whose name belongs at the beginnings of what sorts of shows. Richard Hammond excels at anything scientific that may or may not include explosions, Jeremy Clarkson is best at anything that involves being judgmental, and James May … well, he’s generally good at just sort of knowing things. 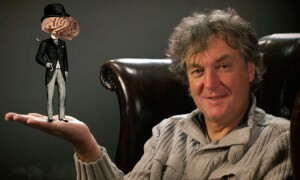 I haven’t seen all of his past non-“Top Gear” series (though “Oz and James’s Big Wine Adventure” was pretty fantastic), but I do know from what I’ve seen that his reputation for being “The Stuffy One” does stem from truth. Which is not to say he’s nearly as insufferably stuffy as his co-presenters like to say he is. His points of discussion are far more down-to-earth, though — you’re more likely to hear him talking about why you can’t see in the dark as opposed to how to blow up speed cameras or how jetpacks work. The series consists of three short episodes, each focusing on one topic: the human body, the universe, and weather. May himself narrates, though he tends to spend the entirety of the show either sitting in a nice leather chair or standing in front of a relevant backdrop. The bulk of the visuals are bizarre animated charts and sequences, a few bordering on Gilliam-esque without ever really stumbling into nightmare fuel territory. Odds are that you’ll run into pockets of stuff you already knew and perhaps even consider common knowledge. I did at points myself, but I never found myself going “Why is he wasting time on this?” Even things I already knew or still remembered were interesting, partly because of the wacked-out visuals and partly because May introduces an extra degree of accessibility. By way of the stuff I didn’t know, things were still clear. And interesting. Your mileage may vary on this one, though. I know there are some out there who find any sort of sit-down discussion/lecture rather boring, and those viewers might not enjoy this. But the episodes are under half an hour in length, don’t dwell on anything needlessly, and are paced in such a way that you stay interested. I’m not sure if the information in it is eye-opening, or if you’ll come away feeling brilliant, but it’s a fun afternoon’s diversion. “James May’s Things You Need to Know” isn’t available on R1 DVD at this time … so apparently there are some people who believe we don’t need to know how fast sperm travels. Hm.